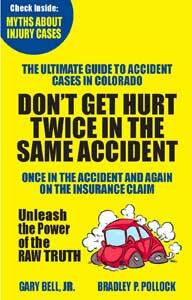 Denver Motorcycle Accident Attorney | Bell & Pollock P.C. Riding a motorcycle can be an exhilarating and cost-effective way to get around. It can also be very risky, as riders are about 35 times more likely than those in passenger vehicles to be injured in a collision each time they get on the road. The lack of a surrounding structure to absorb the impact – This usually ends up meaning that a significant portion of the force caused by a collision is imparted to riders’ bodies, rather than a vehicle structure. The vast weight discrepancy between passenger vehicles and motorcycles – While the average motorcycle weighs between 400 lbs. to 1,000 lbs., the average passenger vehicle weighs about 4,000 pounds – between four and ten times what a motorcycle weighs. This means that even low-speed collisions can cause substantial damage to riders. At Bell & Pollock, P.C., our lawyers are dedicated to representing injured riders and helping them succeed in their financial recovery. While we can help riders identify all liable parties after an accident, they can also help riders protect their rights, stand up to insurance companies and secure the full amount of compensation they deserve for their injuries and losses. 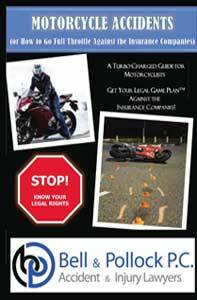 If you or a loved one has been injured in a motorcycle accident call us for a free case evaluation. The experienced attorneys at our motorcycle accident law firm can investigate your driving incident to make a fair determination of the actual cause of the accident as well as any associated liability. Thanks to our years of experience, we know how to find the evidence we’ll need to represent you, and we know how to preserve the existing evidence. We also know how to assess your losses—not only the ones you’ve already experienced but those that the accident may affect in the future. You need a trial lawyer with experience to negotiate with aggressive insurance companies that don’t have your best interests at heart. Nearly four out of five two-vehicle motorcycle accidents are due to the motorcycle being struck by another vehicle from the front. These types of accidents can be particularly deadly for bikers who do not have the same level of protection against collisions as car and truck drivers do. These accidents occur under a variety of different circumstances, including drivers running red lights, failing to yield the right of way, or turning left into a moving motorcycle. While a patch of gravel or a minor pothole might be trivial to a passenger vehicle, these relatively small defects can result in catastrophic results for a motorcyclist. It’s generally up to the jurisdiction in which you are riding to prevent these dangerous defects, which also include things like cracks, uneven pavement, and dips. Malfunctioning traffic lights can also be at fault. Premises liability claims are often possible in the event of an accident caused by a roadway defect. 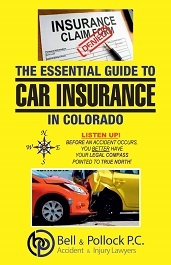 Single vehicle accidents are often, as noted above, caused by dangerous roadways. Defective motorcycle parts may also cause some. Sadly, however, the negligence of the cyclist can also be a contributing factor. Avoid driving after drinking—for example, over 1/4th of motorcycle operators that died due to an accident in 2016 had excessive blood alcohol limits. Don’t speed, and always follow the rules of the road. 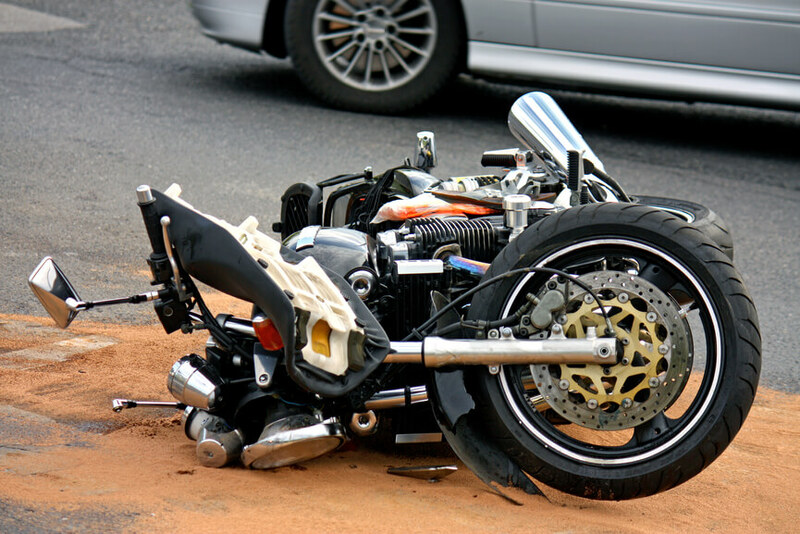 We understand just how serious the consequences of a motorcycle accident can be for our clients. There are many types of damages and losses you can pursue after an accident, including compensation for any injuries you’ve sustained. These injuries may result in current costs, like medical bills or lost wages from work. They can also be part of a calculation that includes losses in the future, like the loss of future earnings. You need an experienced personal injury attorney to help you navigate this part of the law. These are some of the most severe injuries that one might suffer due to a severe crash. Traumatic brain injuries can have life long consequences, like memory changes, mood alteration, fatigue, chronic pain, loss of balance, dizziness, and more. When not adequately treated, traumatic brain injuries can be deadly. The victim of a spinal cord injury may require more than a quarter of a million dollars to manage their treatment and other expenses in the very first year following their accident. Many require long-term health care and assistance with even basic tasks. Because of the many types of spinal cord injury, symptoms cover a wide range of possibilities, including nerve pain, breathing difficulties, or even paralysis. When a motorcyclist strikes the pavement, they often slide across it. In some cases, this can damage multiple layers of their skin. These injuries may not seem dangerous initially, or the damage may be immediately apparent. In either case, it is often necessary for victims of road rash to obtain reconstructive surgery and skin grafts. If damage to one or more of the cyclist’s limbs is severe enough, it may require amputation. Amputation is costly both in the short- and long-term. Expensive surgeries, prosthetics, and therapies are often required, with amputees needing to adapt to doing basic tasks like walking or writing. The 106 deaths from motorcycle accidents in 2015 showed an increase of almost 12 percent from the previous year, and 20 percent higher than the number of recorded deaths in 2013. Can I still File a Suit if I was Partly to Blame for my Motorcycle Accident Injury? Sometimes motorcyclists believe that if they contributed to the accident themselves, they aren’t entitled to compensation for their injuries. On the contrary, Colorado’s doctrine of comparative negligence means you may very well be entitled to compensation, even if you were partly at fault. 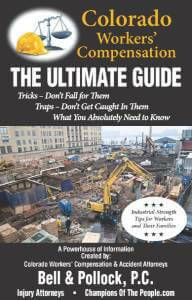 The only time you are not able to receive compensation is if you were primarily at fault. As long as your fault is calculated to be less than 50 percent, you may be able to receive at least partial compensation for your injuries. For example, if it is decided that you were 15 percent at fault, you’re still entitled to 85 percent of the calculated compensation. 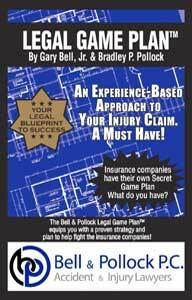 Contact the Experienced Attorneys at Bell & Pollock, P.C. If you have been injured in an accident, or if you have lost a loved one in a fatal motorcycle accident, you can turn to Bell & Pollock, P.C. for experienced help with your financial recovery. At Bell & Pollock, we are proud to be champions of the people, providing victims of negligence with superior legal representation to help them obtain the full amount of compensation they deserve. To find out more about how we can help you, call us at (303) 795-5900 or email our firm using the contact form on this page to schedule a free consultation with a Denver motorcycle accident attorney. During this meeting, you will receive clear, honest legal advice about your case, your rights and your best options for moving forward, which can help you make the best decision for you. 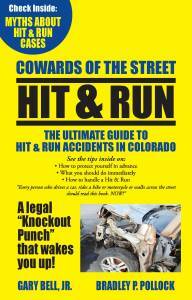 By taking the proper safety measures, you can ensure your safety and enjoy the Colorado scenery to the fullest. Motorcycle accident attorneys deal with a broad range of accident cases in Denver, from hit-and-run incidents to uninsured motorists.